Welcome back, sorry that I have missed a few, but we are back to reviewing comics every day! 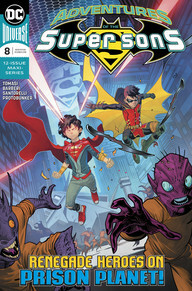 Today, Seppin is going to be reviewing Adventures of the Super Sons #8 written by Peter Tomasi and art by Matt Santorelli and Carlo Barberi. I love the Super Sons. I think that Peter Tomasi nails Jon Kent and I also think that he does a great job writing the relationship that he has with Damian. These two are best friends but at the same time, they are sort of forced to be because of their fathers. It makes an amazing mechanic that I really enjoy reading. For the past seven issues, they have been dealing with Rex Luther, who is an alien that aspires to one day be as powerful as Lex Luther and maybe a little more so. Rex is planning on taking over Earth but has been generally focused on the Super Sons. Last issue the Super Sons got locked up in a prison with Rex and his injustice army. This time we get a little more conclusion to the prison planet story and also got some more characters in the injustice army, such as Cat-Man and more! This issue was good and had a lot of great dialogue, I just wish that this whole Rex Luther story arc would come to an end a little faster. It’s a long story if you think about it because Tomasi is stretching it into a maxi-series. Unlike last time where he pulled off two story arcs in a maxi-series. However, the end is in sight and I can’t wait to see how Damian and Jon deal with Rex. Overall, it’s a good book and I am excited to see how this all ends!